The Wyomissing Park System is comprised of over 350 acres and is easily accessible. There are numerous parking areas for those who arrive by auto. Mr. Ferdinand Thun purchased the land and structures on both sides of the Wyomissing Creek in 1929. These areas were diligently preserved in excellent condition. In the 1970s, the land was transferred to the Borough of Wyomissing, allowing it to be used as parkland. 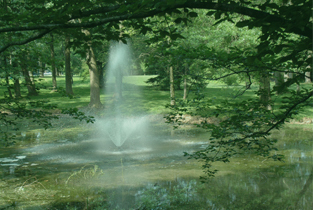 The Borough of Wyomissing currently maintains the park system and encourages the Wyomissing residents to experience and enjoy this beautiful natural feature of the Borough. The Borough Park and Shade Tree Commission’s function is to make recommendations to Borough Council concerning the development of existing and all subsequently acquired land within its jurisdiction and which shall become part of the park system.It also makes recommendations as to development, formulation, implementation and pursuit of an ongoing plan and program of maintenance of the park system including, but not limited to, areas of native vegetation, waters, fields, vistas, paths, trails, flora, and trees in their natural state.